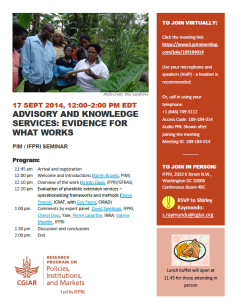 A seminar under this title will take place on September 17, 2014 from 12 to 2 pm EDT, at IFPRI headquarters in Washington, DC. The research team working on rural advisory and knowledge services under the CGIAR Research Program on Policies, Institutions, and Markets (PIM) will present recent developments in their work and talk about pluralistic extension services with a focus on how to make new frameworks and methods operational. The overview of the work will be presented by Kristin Davis, PIM lead for Advisory Services within Research Flagship 3, research fellow at International Food Policy Research Institute (IFPRI), and executive secretary of the Global Forum for the Rural Advisory Services (GFRAS). Steve Franzel from the World Agroforestry Center (ICRAF) and Guy Faure from CIRAD will speak about evaluation of pluralistic extension services. The expert panel will include Cheryl Doss (Yale University), Pierre Labarthe (INRA), Valerie Mueller (IFPRI), and David Spielman (IFPRI). RSVP if you plan to attend the seminar in person, or will join online.